When an overlong intermission comes as a relief, whatever you’re waiting for can’t be too urgent. Such was the case on Wednesday at the Brooklyn Academy of Music’s Harvey Theater, when Beijing Dance Theater opened the United States premiere of “Wild Grass” as part of the Next Wave Festival. Of the program’s 100 minutes, about 40 were spent changing sets between the three acts, rendering the show itself almost secondary. During those pauses, you could browse the poetry in the program and ponder its relationship, or lack thereof, to the less substantive dancing. 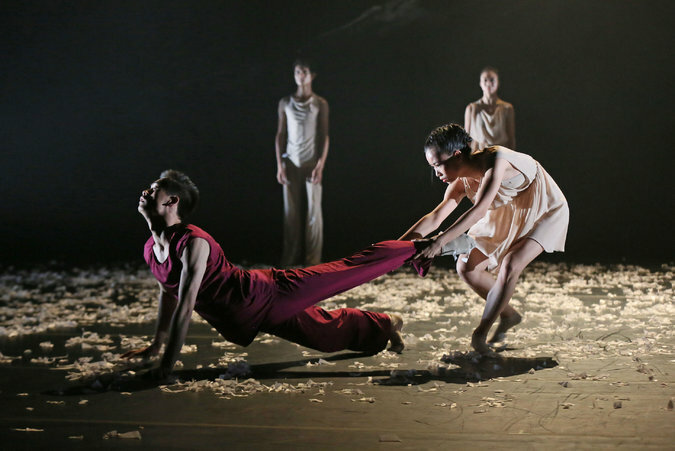 Choreographed by the troupe’s artistic director, Wang Yuanyuan, “Wild Grass” draws inspiration (and its title) from a 1927 collection of poems by the leftist writer and intellectual Lu Xun. These stark verses, with images of darkness and disappearance, provoke and unsettle: “The past life has died. I embrace this death with great joy, for I realize that it was once alive.” They ask to be read over, to be examined from this angle and that. The same, alas, cannot be said of Ms. Wang’s choreography, a kind of lithe, glossy contemporary ballet that deploys the same steps over and over: ultrahigh kicks, low lunges, robotic arms. The more it happens, the less we seem to know about the 16 dancers. If themes of emptiness and lifelessness thread through the poems (“Let me raise my ashen gray hand and feign a toast”), Ms. Wang takes them too literally. The monotonous music — piano, then techno, then violin and cello — doesn’t help. Each section uses a different floor surface. In the first, “Dead Fire,” it is black, covered with wispy white leaves beneath the backdrop of a full moon and snowy mountain peaks. In these windswept environs (more leaves blow in from offstage), one man in red stirs to life amid an ensemble in translucent beige. They could be his allies, whereas Part 2, “Farewell, Shadows,” more often pits partners against each other. Here Ms. Wang explores the weight of limp or stiffened limbs, as the women — in black bras and teeny black shorts — squirm in the men’s arms or are dragged across the bright white floor, all too familiar tropes. In Part 3, “Dance of Extremity,” a floor of parched, matted golden grass slopes up at one end. A dictatorial figure stands on top, reining the running, tumbling dancers into unison, the outermost surface of a story. “Wild Grass” continues through Saturday at the Brooklyn Academy of Music’s Harvey Theater, 651 Fulton Street, Fort Greene; 718-636-4100, bam.org.